i want to introduce one of the amazing and affordable SmartWatch you can get for yourself with almost the same features you see on an android phone. Rwatch M6 Bluetooth SmartWatch features the ability to store contacts, make phone calls, sync your music and above all, supports text messaging, Wechat, mms and lots more. 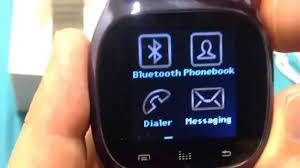 The Wristwatch supports all the phones with 2.3 to 4.0 version of Bluetooth. However, iPhone devices can not utilize Camera, and Message control functions.